About 120 km from Agartala,60 km from Udaipur, 31 km from Amarpur and 11km from Jatanbari. The origion of the Gomati River. 41 sq.km of water surface and 48 islands within it. The Hydel Project near the lake from where river Gomati originates is called Tirthamukh, a pilgrim center. Every year On 14th January a famous 'Poush Sankranti Mela' takes place. In winter, various species of migratory birds comes. A popular picnic spot and boating facilities are available. The lake is the confluence of rivers Raima and Sarma. Accommodation: Raima Tourist Lodge at Jatanbari. An artificial lake of 20 hectares was built in 16th century. About 55 km from Agartala, near Melaghar town in Sepahijala district. About 5.3 sq. 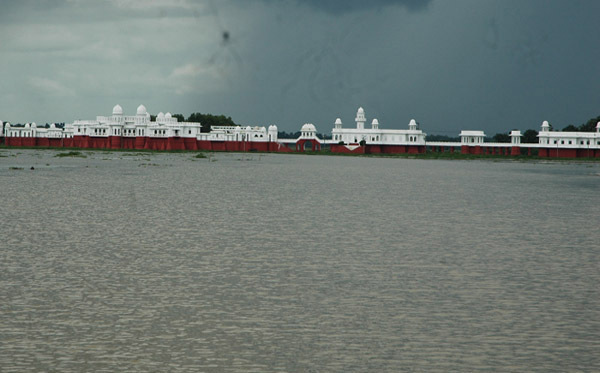 km water area is a famous tourist spot, due to the Nirmahal. Boat festival is organized in July/August, every year. Famous lake palace Nirmahal is situated in Rudrasagar. Maharaja Bir Bikram Kishore Manikya built the palace in 1930 A.D.
Excavated by Maharaja Dhanya Manikya in 15th century. On its bank the Kasba Kali Temple is situated. A large number of pilgrims comes ever year. Accommodation: Comilla View Tourist Lodge at Kamalasagar. Located in Kailashahar sub-division of Unakoti District. Sprawled over about 5 sq km. Famous for Shivasthalam and abounds in natural beauty. Attracts the nature lovers and the devotees. Every year fairs are held twice in the courtyard of Shivasthal. An artificial lake considered as sacred lake. Situated in Udaipur in Gomati District. On its west bank Mata Tripureswari Temple is there. A famous sacred place. Also known as Puran Dighi.